If you live in USDA zones 9b-11 and are looking for a rapidly growing hedge plant, you might want to look into growing Brazilian cherry trees. Read on to find out how to grow a Brazilian cherry and other helpful Brazilian cherry tree information. The Brazilian cherry tree (Eugenia uniflora) is a member of the Myrtaceae family and is related to guava, mountain apple, jaboticaba and other Eugenia members. 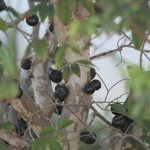 This shrub, often referred to as a tree, is also more commonly known as Surinam cherry or Florida cherry, due to the naturalization of the shrub throughout the state. It is native to eastern South America, extending from Suriname, Guyana and French Guiana down to southern Brazil and Uruguay, where it can be seen growing in thickets along river banks. Surinam makes an excellent hedge or screen with smooth, resinous, aromatic leaves which are brilliantly red when young. These small, thin leaves are receptive to pruning, and the plant remains dense down to its base, making it ideal for hedges. The tree attains a height of 25 feet (7.5 m.) with a high, slender, spreading habit. The small, white, aromatic blooms are followed by red, ribbed berries that make for eye-popping color in the landscape. Ornamental they may be, but are Brazilian cherries edible? Yes, Brazilian cherries are edible. They aren’t found at the local grocers (with the exception of perhaps Hawaii) but they are extensively cultivated in some regions. These “cherries,” which are really not cherries, can be made into preserves, pies, syrups, or added to fruit salad or ice cream. The Brazilians ferment the fruit’s juice into vinegar, wines, and other liqueurs. Some sources say they taste a lot like mango, which definitely sounds tasty, while others state that the high amount of resin in the plant impart this flavor into the fruit. The fruit is incredibly high in Vitamin C.
There are two major varieties of “cherry,” the common blood red and the lesser known dark crimson to black, which is less resinous and sweeter. In Florida and the Bahamas, there is crop in the spring and then a second crop from September through November. Keep in mind that if you are growing Brazilian cherry trees in the ground, they are rapid growers and will need some space, so plan your rows 18 feet (5.5 m.) apart. For hedges, plant 2-5 feet (12 -1.5 m.) apart. If you are only planting one shrub, plan on planting it at least 10 feet (3 m.) from other trees or shrubs. You can also grow Brazilian cherry trees in a container, provided you choose a large enough size to support growth. Brazilian cherries dislike wet roots, so well-draining soil is extremely important. A combination of soil, sand, and perlite will keep your cherry happy. For the best fruit yields, plant Brazilian cherry in full sun with at least 12 hours of bright sunlight whenever possible. Once established, Brazilian cherry tree care is minimal. Because the plant has a deep root system, it can handle periods of drought but prefers some irrigation. Water the tree weekly or daily depending upon conditions or if it is in a pot. Do not overwater! That’s a sure way to kill the tree. Once watered, wait until the top 2 inches (5 cm.) of soil are dry before watering again. Fertilize at the same time that you are watering with a time release 8-3-9 fertilizer during the growing season. Read more articles about Brazilian Cherry Tree.